I hadn’t long been a member of Fab.com, the relatively new Facebook-connected social networking site for gay men. I liked it. Sleek, clean and cool, the network was easy to navigate and understand. I just wish it had caught on steam, especially in the Carolinas. We’ve had a lot of fun building toward that vision and we’ve met some incredible people along the way. Hopefully you’ve enjoyed and appreciated your experience with us. Your participation and contribution to fab.com has been the core of our popularity. This past year has been a monumental year for gay rights and acceptance. From the repeal of Don’t Ask Don’t Tell, to court victories over Prop 8, “Born This Way,” the President walking away from the Defense of Marriage Act, and the impact of the It Gets Better Project, this has been an incredible year of progress. As we reflected on these developments, we realized that all of this progress has diminished the need for a gay-specific social network. We don’t need a gay Facebook or a gay Yelp or a gay Foursquare or a gay Groupon. The original versions are fantastic, and we are becoming more and more integrated into the mainstream. At the same time, we recognized that one of the aspects of fab that we enjoy the most and that our users are getting great value from — providing great deals on amazing products and services — has little to do with sexual orientation. A great find is a great find and a great deal is a great deal, regardless of who you are. No need for a gay-specific social network? 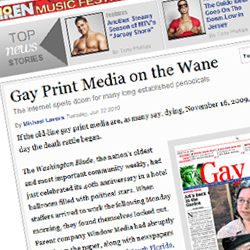 It’s an interesting thought, and the same concept could be thrown into any scenario: Gay newspapers? Gay TV networks? Gay community centers? Gay bars? It’s true that LGBT folks are “mainstreaming” more and more. I hate the term, by the way. “Mainstreaming,” urgh — it reminds me of Showtime’s “True Blood” and seems to compare us to vampires. Regardless, I can’t ignore the reality. Though there’s still an awful lot of queer folks who live in places where “mainstreaming” isn’t an option, it’s happening. The trend can be found even in places like Charlotte. While the Queen City isn’t a friend politically or religiously to LGBT people, our Uptown bars, clubs and restaurants are mostly gay and straight, mixed crowds and many openly welcome gay business. I’m excited to see exactly what Fab.com operators have in mind. After all, I like design as much as I like meeting other gay people. It’ll be interesting see just how they handle going from a gay social network to a “love of design”-driven site. I hope they surprise me.